The world is moving out of the ‘flat’ mode of the economic cycle. The uneven recovery is making businesses hesitant and some are panicking as we appear to enter the feared double-dip. The Third Wave is the final phase of the recessionary cycle where the market bottoms out and turns towards strong recovery. While the double-dip recession might be a worrying place to be for some business owners, it also provides a hugely significant wealth creating opportunity. Timing what you do in response to the market, is key. This seminar will provide you with the market and business insights that will enable you to act with confidence to grow your business faster through the next phase of the economy. 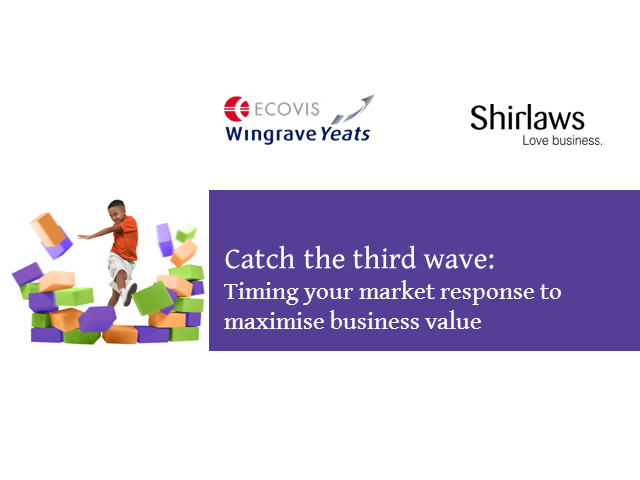 The 45-minute seminar will be presented by Rowan Andrews of business coaching firm Shirlaws (www.shirlawscoaching.co.uk) and Christopher Jenkins of accountants Wingrave Yeats (www.wingrave.co.uk). Shirlaws was founded in 1999 and quickly became one of the fastest growing business coaching companies in the world. The firm helps business owners accelerate growth to achieve higher business valuation. Wingrave Yeats is a Partner-led, award-winning firm of Chartered Accountants and Business Advisors, based in W1 with international reach through the Ecovis Network. According to Wikipedia, email marketing is a form of direct marketing that uses e-mail to send commercial or fundraising messages to an audience. Or as Entrepreneur.com says: Marketing via e-mail, usually through the use of sales letters or customer newsletters. In this webinar we will discuss the role of email marketing within an Omnichannel strategy. Email marketing is no longer more the sending of just the ordinairy weekly e-newsletter. In less than 60 minutes EURObizz and BrightTALK will take you on a journey in the world of email marketing and the 2016 trends on this area. Travelex went from having no mobile presence to the ownership of two category-defining mobile apps in under 6 months. Their apps have been featured by Apple as the “Best New Apps” and they’ve driven insatiable consumer demand for Travelex products. This session will be led by Adam Warburton, Head of Mobile at Travelex, and will explain how they achieved this through a customer centric mobile strategy a commitment to building meaningful relationships on mobile. Social advocacy has become a key component of many organisations’ social media strategies, whether they want to focus on Employee, Customer, Ambassador, Channel, or Influences advocacy. Join Microsoft, Xerox, Avalara, Zoe Sands, the social selling expert and Ian Moyse the number 1 cloud influencer on social media in a panel discussion about social media advocacy and the best practices and tips to making your program a great success in 2016 and beyond. Chief Digital Technologist Mike Bainbridge from Rackspace talks to BrightTALK about the top 3 Ecommerce Trends that he is predicting for 2016. Discover why brand and culture are two sides of the same coin in professional services, and how to align them to achieve your strategic goals. In this webinar, Monica Ralli CMO and Arch Singh CHRO share how they initiated a transformation effort to renew the organization’s brand and culture, increase employee engagement and accelerate commercial success. By developing a Client Value Proposition and Employee Value Proposition in tandem, Hay Group has created a compelling story on releasing the full people potential of both clients and colleagues that resonates in both the marketplace and the organization. Learn why HR and marketing should work so closely together and how to achieve this in your organization. - Tapped into social media to identify and target key influencers around the event. - Used social media analytics to engage attendees and visitors to the city. - Enabled designers, retailers and industry students with the techniques and tools to get started with exploring their own data for insight. Det er spild af tid at lave kold kanvas til emner, som ikke er klar til dialog. Og du behøver ikke længere gætte dig til dine potentielle kunders behov og interesser. Nu kan du få direkte kendskab til deres digitale adfærd. Og dermed indsigt i, hvad der interesserer dem ved dine produkter. Brug marketing automation til at pleje og modne dine emner, inden du banker på. Når marketing har kvalificeret og scoret nye leads overdrages de til salg. Det gør sælgere og account managers i stand til at få en relevant dialog med nye kunder. Mange mindre og mellemstore virksomheder har et stort uudnyttet potentiale i at styre deres leadgenerering intelligent. Når de tilgår deres leadgenerering på en struktureret måde med undersøttelse af Marketing Automation er resultatet en bedre markedsdialog og præcise budskaber. Og det giver bedre synergi med salg. -) Få tips til at komme godt igang med marketing automation – enkelt og effektfuldt. -) Forstå hvordan du opnår indsigt i dine potentielle kunders interesser. -) Høre hvordan du prioritererer og kvalificerer leads ved hjælp af lead scoring. -) Opleve hvordan en kunde klædte sælgerne på til bedre dialog og fik målbart mersalg. The reality is, meetings are still a crucial part of running an effective business. The value of effective meetings saves companies an average $2,600 per employee per year. In this webinar, you'll learn how to save time + money through the power of Integrated Meetings, we'll show you a process we've taken over 15+ years of research to perfect and refine meetings that you can apply immediately in your company and with your team. Jérome Petazzoni, Tinkerer Extraordinaire, Docker Inc.
What's Docker? Why is it popular? What are containers? Why and how are they going to drastically improve how we build, ship, and run applications? How to get started with Docker and containers, and leverage them to achieve faster, safer deployments for software stacks big and small? In this presentation, Jerome Petazzoni wil answer all those questions (and a few more) to give you a clear overview of Docker and containers, as well as a quick bootstrap to get started with this technology. From ecommerce platform selection to warehouse, order and product management systems, join ecommerce architect specialist Mike Bainbridge as he gives an overview of key software solutions for retailers. The CIO is faced with reconciling the, apparently, irreconcilable. How does he build a cost effective technology platform that provides business agility, and manages risk? In this session, Steve O’Donnell explains the critical success factors in achieving that desired outcome, the considered compromises, the strategies and tactical approaches that the CIO will need to adopt to deliver business benefits and keep his stakeholders onside. He will look at the different types of application and how they need to be managed and hosted. Where do we build, where do we buy and where is configuration the right answer? How do we choose between in-house infrastructure, managed cloud services and engineered systems? Join Stephen for a structured approach to providing a cohesive strategy for IT investment that makes sense, and optimises business outcomes whilst being simple enough to gain business stakeholder buy in and approval. IT spend has become one of the largest budget line items in companies today. IT organizations worldwide spent over $4 trillion dollars in 2013 alone. Despite the growth in IT spend, many IT organizations do not have the capability to clearly and easily articulate where that spend is going, how it correlates to the services they are delivering or what value the business is realizing from the services. In order to stay competitive, businesses are seeking ways to optimize and align future IT investment decisions with the strategic direction of the company. By making all of the costs of running IT transparent, IT can change the way business units consume IT resources, drive down total enterprise IT costs and focus on IT spending that delivers real business value. Welcome Staffing & Recruiting Agency Professionals to Jobscience & Menemsha Group's 3-Part, Sales Productivity Series --- "The Road to Winning More Business." Part 3: Cold Calling Techniques That Can Take Your Agency To The Finish Line. No Joke. Cold calling is the lifeblood of the staffing sales rep yet so few find it an effective use of their time. Proven sales coach for staffing agencies, Dan Fisher of Menemsha Group will dispel the myth around the ineffectiveness of cold calling, and in fact provide a a fresh approach to cold calling that actually yields results. •Why (and how) you need to do the opposite of what prospects expect from sales people? •How sales people create objections (and how to stop these behaviors)? •How to craft a message that cuts through the clutter and will compel the client to engage? •How to power your recruitment agency CRM with market intelligence so a cold call isn't so cold? It's often said that retaining customers is a lot easier and cheaper than finding new ones. But how do you put this into practice and use data to your advantage? Resources for small business owners on how to thrive, grow and maintain profitability in the current economy among larger companies.